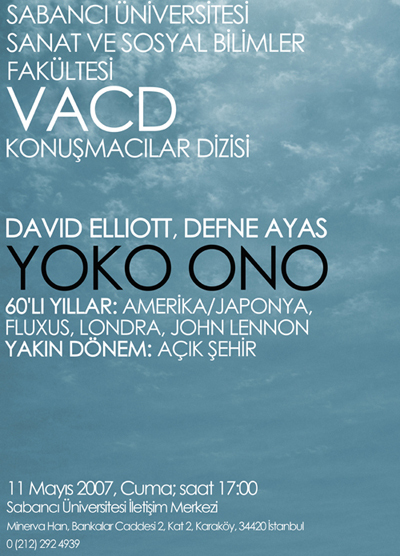 Kasa Gallery which is hosting Yoko Ono’s first exhibition in Turkey, is organizing a talk in which Ono’s art and position in contemporary art will be discussed. The meeting will be held on 11th May 2007, 17:00 at Sabancı University Karaköy Communication Center and David Elliott (Director, Istanbul Museum of Modern Art) and Defne Ayas (Curator, PERFORMA, New York University Shanghai) will be participating as speakers. Presentations will be in English and translation will be provided. David Elliott, will present a brief biography of Yoko Ono’s background in US and Japan, and talk about the context of Japanese art world in 1950s and 1960s, Fluxus, her early work in Japan and London and Ono’s encounter with John Lennon. Defne Ayas will talk about artist’s recent production and specifically about ‘Open City’.